THE TERROR PROJECT: SALE and a RELEASE PARTY VIDEO TREAT! Want some great summer chillers to enjoy at the beach? Now’s your chance to get nine great novellas and pay less…and scroll down to get a peek at the private Three on a Match Release Party! 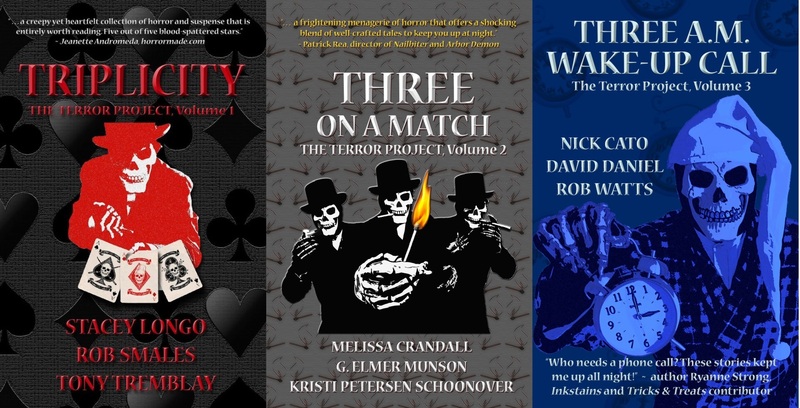 Books & Boos Press is offering the first two books in The Terror Project series—Triplicity, which contains stories by Stacey Longo, Rob Smales and Tony Tremblay—and Three on a Match, which contains my J-horror inspired piece “Splendid Chyna” and tales by G. Elmer Munson and Melissa Crandall—for a special sale price TODAY (June 4) through June 10 (next Sunday). Triplicity and Three on a Match will be $9.99 (30% off) for the paperback and $1.99 for the ebook (50% off). In addition, the third volume, Three A.M. Wake-Up Call, hits Amazon on Tuesday, June 5 (tomorrow) and is available for pre-order today. This third installment showcases novellas by Nick Cato, David Daniel, and Rob Watts. Want them on audio? Guess what? Audio books are on their way! I’ll post on this blog when those are available. Below, get a peek at the private Three on a Match Release Party, which was held at my house in September. Don’t miss out, and happy reading! Light it Up with me at Annie’s Book Stop in Worcester, MA this weekend! 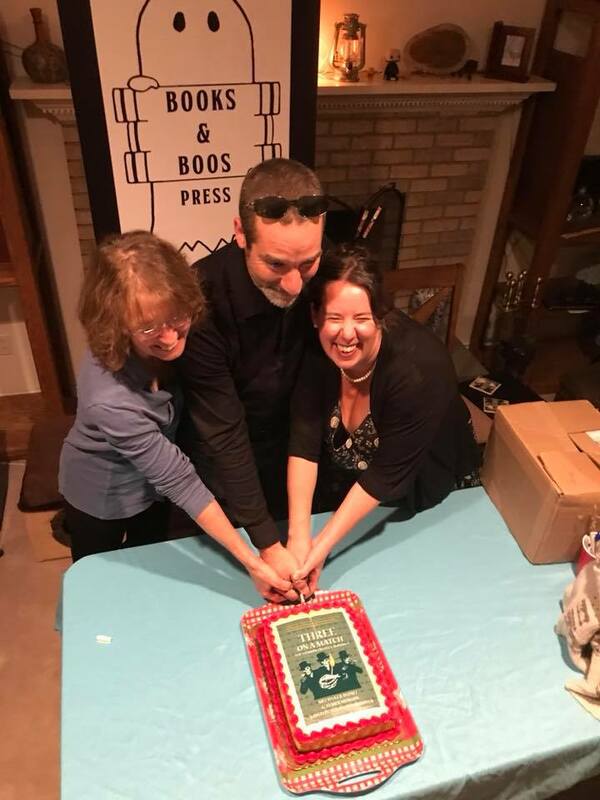 Melissa Crandall, g. Elmer Muson, and I cut the cake at the Three on a Match release party, September, 2017. 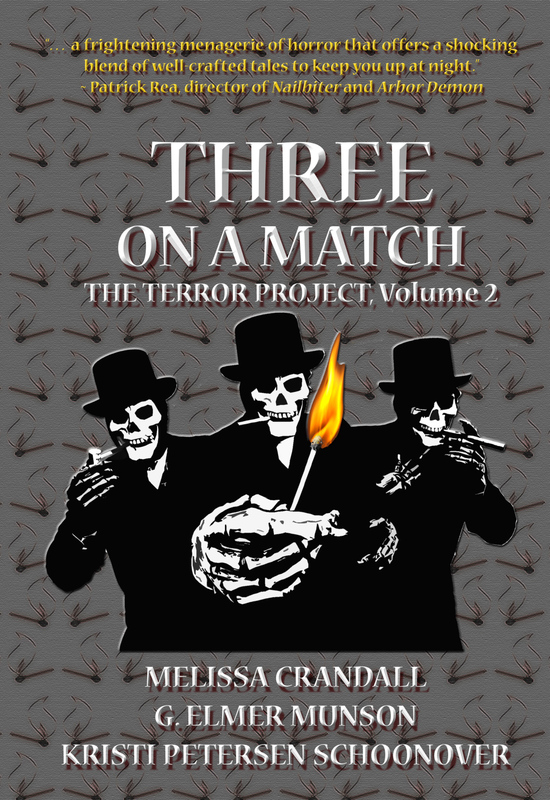 Join me and fellow writers g. Elmer Munson and Melissa Crandall at Annie’s Book Stop in Worcester, MA this weekend for a special reading from the novella collection Three on a Match! The Light it Up: Three on a Match celebration of literary horror event takes place on Independent Bookstore Day at Annie’s from 1 p.m. to 4 p.m. Saturday, April 28. With the focus on horror and its connection to the real world, we’ll read a portion from each tale in the book, talk about where the story came from and share its connection to reality. There’ll be some Mad Libs, snacks, and giveaways (like those nifty matchbooks you could only get if you were at the Three on a Match release party). Some of the contributors of TRICKS AND TREATS signing at Bank Square Books, Mystic, CT, October 26, 2016. From left: Dan Foley, Melissa Crandall, John B. Valeri, Ryanne Strong, Stacey Longo, me (Kristi Petersen Schoonover). The collection includes stories by Stacey Longo (Amston), Melissa Crandall (Hebron), G. Elmer Munson (Vernon), Dan Foley (Manchester) and John Valeri (Portland) and Ryanne Strong (Norwich). It also includes lesser-heralded ghost stories by Mark Twain, Harriet Beecher Stowe, and Charlotte Perkins Gilman. In the fall of 2016, several of us did readings around the state. I was able to participate in one at the Whiton branch of the Manchester library, and one in Mystic at Bank Square Books. What a blast we had! Raising a glass! Left to right: Stacey, me, Melissa. Photo by Jason Harris. At Bank Square Books, we group-signed many copies. At some point I started signing Stacey’s name. Duh. Photo by Stacey Longo Harris. Signing at the Whiton branch of the Manchester Library, October 24, 2016. Left to right: me (Kristi Petersen Schoonover), Melissa Crandall, Ryanne Strong, Dan Foley. TRICKS AND TREATS cover revealed! The cover for Books & Boos Press’ Tricks and Treats: A Collection of Spooky Stories by Connecticut Authors has been released! Creepy tales by famous Connecticutians Mark Twain, John G. C. Brainard, and Harriet Beecher Stowe will be featured. The Table of Contents will also include my story “Crawl” as well as stories by writers Melissa Crandall, G. Elmer Munson, Ryanne Strong, Stacey Longo, John Valeri, and Dan Foley. Rumor has it the volume will also include Charlotte Perkins Gilman’s “The Giant Wisteria,” which is one of my favorites! Currently, the release date is slated for September.